BioShock 2, the upcoming sequel to 2007's haunting and intellect-jarring first-person shooter, will have a multiplayer aspect: something that was absent from the original BioShock. 2K has hired Digital Extremes - a company that has worked on successful titles such as Unreal Tournament and Dark Sector - to concentrate on BioShock 2's multiplayer component. However it has become clear that what Digital Extremes will be doing is not so much a mere "complement" to BioShock 2 as it will be an entire beast of a gaming experience in its own right. In multiplayer mode you'll have access to "weapons, plasmid and tonic unlocks, so that you'll ultimately be able to kit out your player with hundreds of combinations to compete to earn online experience points." 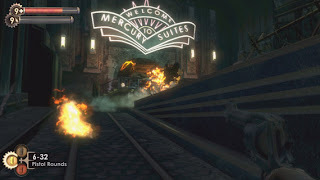 Experience Rapture before it was reclaimed by the ocean and engage in combat over iconic environments in locations such as Kashmir Restaurant and Mercury Suites, all of which have been reworked from the ground up to deliver a fast-paced multiplayer experience. So multiplayer BioShock 2 is going to provide our first-ever look at what Rapture was like before the cataclysmic events of New Years Eve 1958, when the underwater utopian metropolis finally succumbed to the dark side of human nature and erupted into civil war. As one who loves the lore of BioShock, I can dig that much. But what about the BioShock fans out there who either can't get in on multiplayer for various reasons, or who simply don't care for this kind of game play? Are they going to be cheated out of some delicious BioShock history? Will they be punished for their geography or their preference for solo play, and locked out of getting a look at pre-fall Mercury Suites and the Kashmir? Because I'm one of those myself. I've done online multiplayer "shoot 'em ups" before and yeah they're fun for awhile, but personally I find engaging story and characters in a game like BioShock and Gears of War to be more intriguing. I'd much rather explore the worlds of those games at my own pace, instead of having to constantly worry about some 15-year old hormone machine calling himself "Lance" all the way in Minneapolis sniping me from the shadows so he can up his Xbox Live gamer score. So are solitary players like myself going to become a segregated class in the social order of Rapture? Are 2K Games and Digital Extremes going to dictate that individuality is undesirable, that we must be collective in our game play? Somehow I don't think Andrew Ryan would approve of that going on in his city. And I can't believe that there are many solo-oriented BioShock fans who are going to enjoy that very much either. I'm not going to ask for multiplayer to be stripped out of BioShock 2. For those who thrive on that sort of video gaming, I will sincerely hope that BioShock 2's will set a whole new standard for multiplaying excellence. But I am going to be anticipating that 2K Games and Digital Extremes have taken "the rest of us" into account, and will give lone players a chance to also fully explore Rapture at the height of its glory. I'm a solo player myself, Chris. I haven't played BioShock yet, just the demo, and I plan to get it for my PS3 soon. I can completely agree with you. I really dislike that the 360/PS3 generation games put too much effort into online multiplayer, and that the single player aspect ends up being pretty lackluster in quite a few games. But the one thing I like about the BioShock 2 multiplayer is that it's not being made by the same people working on the Single Player portion, but by a completely different developer. So, both parts of the game are hopefully getting the amount of effort put into development. I really wish that would happen more often, or at least the developers completely finish one aspect of the game, whether it's MP or SP, before working on the other one, instead of working on both simultaneously. I do think that the BioShock 2 Multiplayer idea, with the pre-BioShock 1 Rapture, would be better suited as a BioShock 0 game.